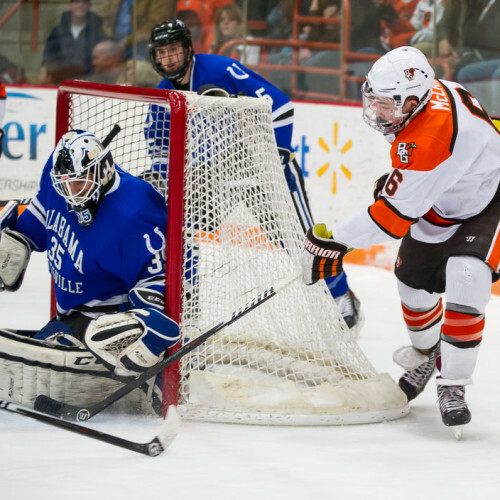 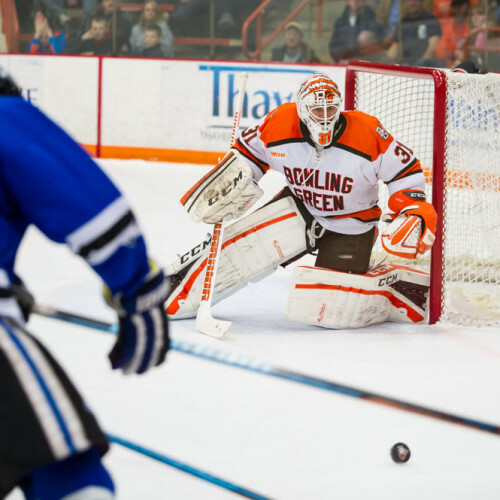 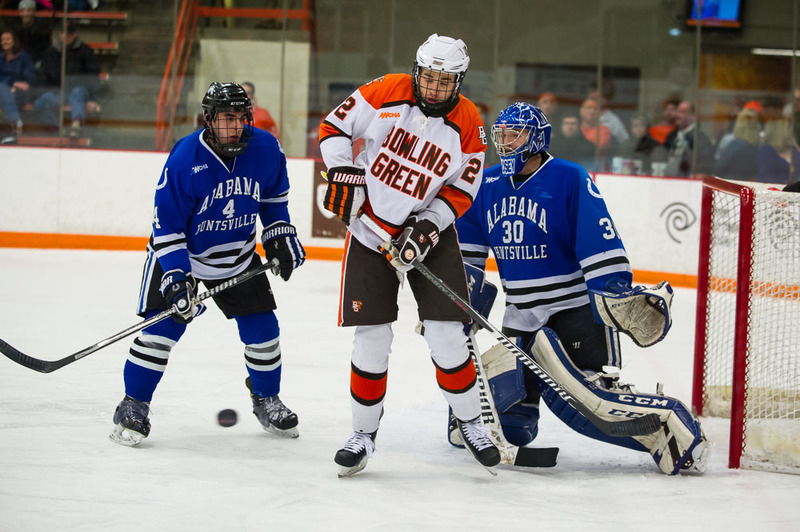 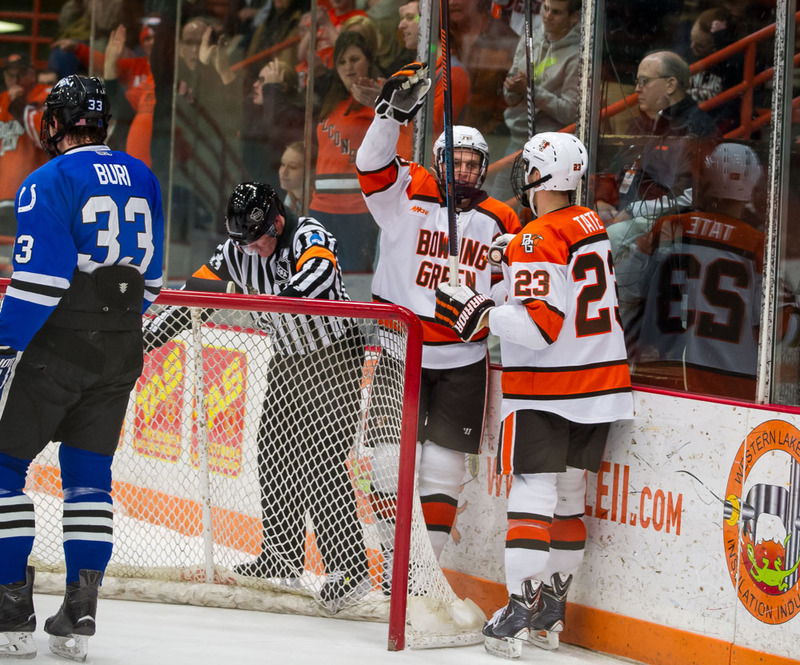 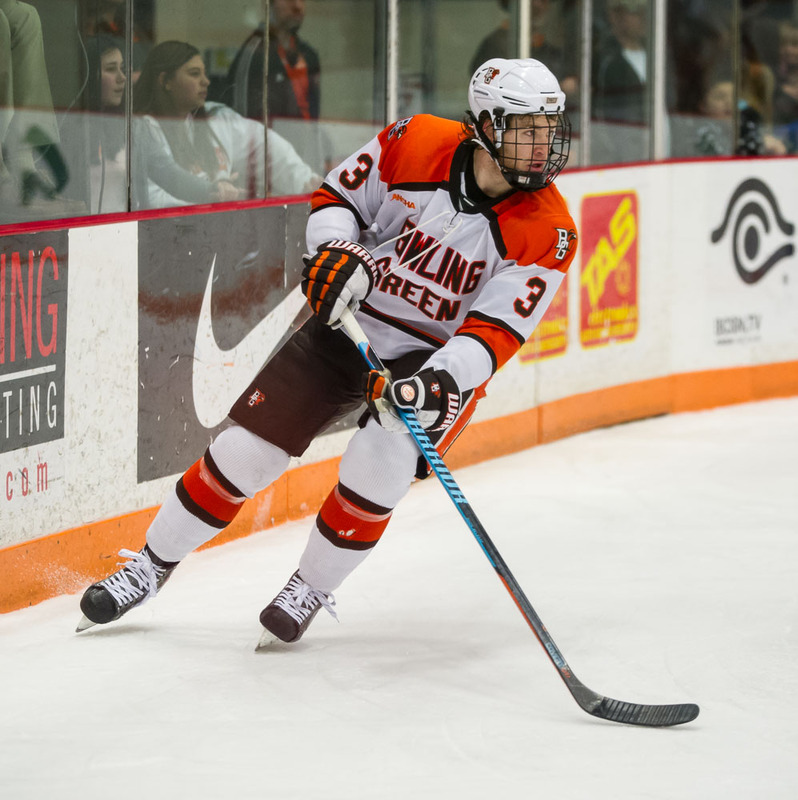 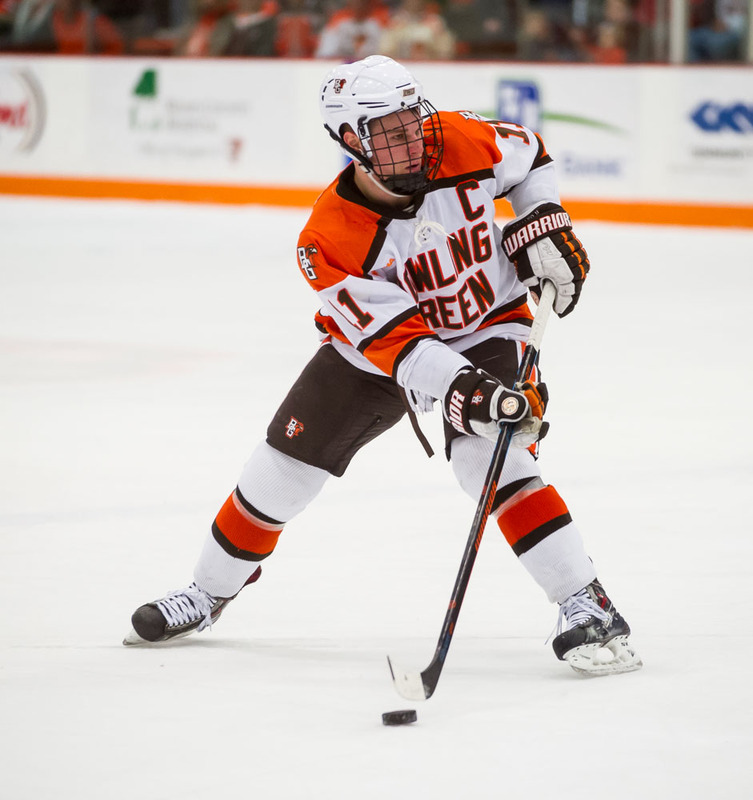 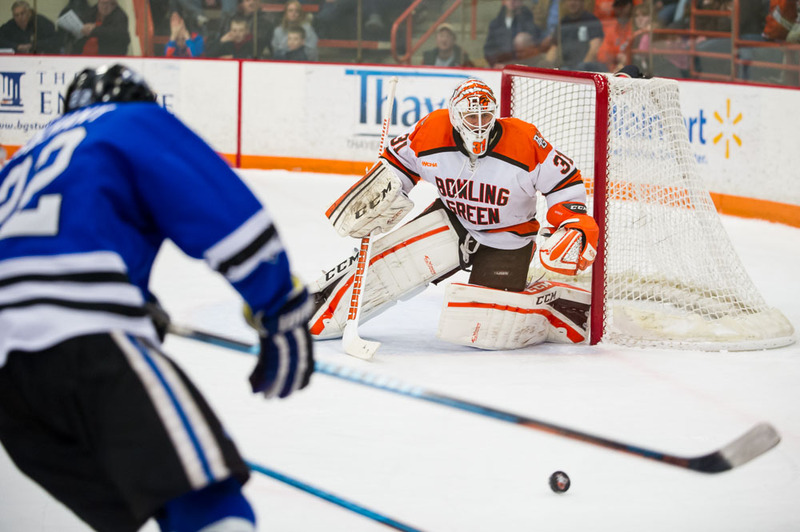 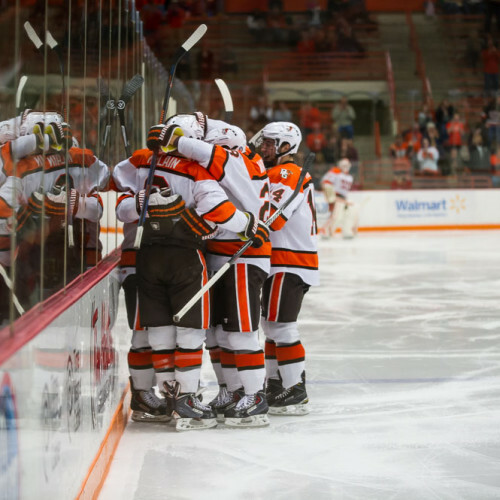 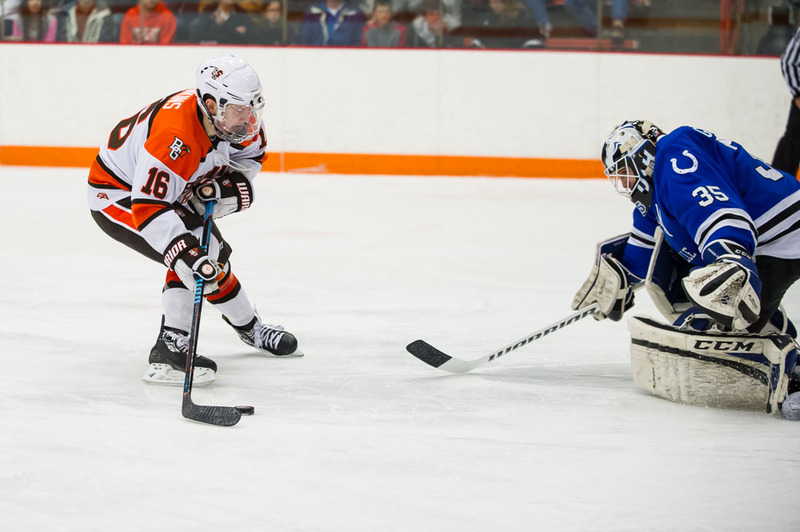 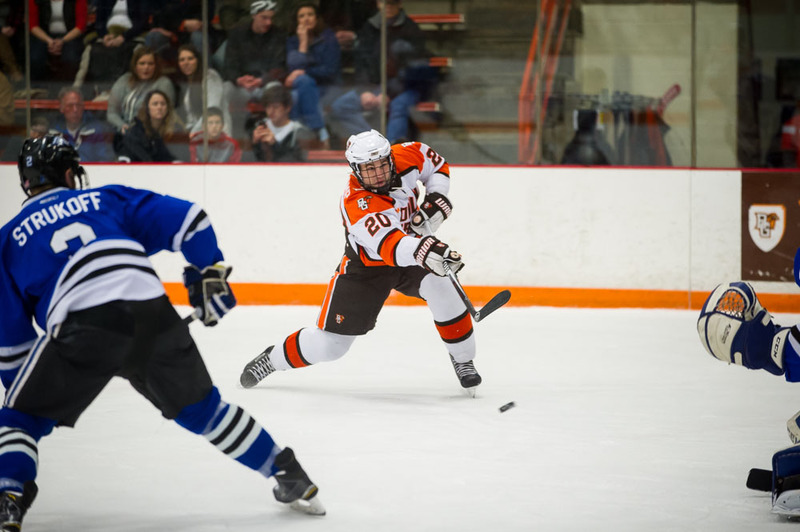 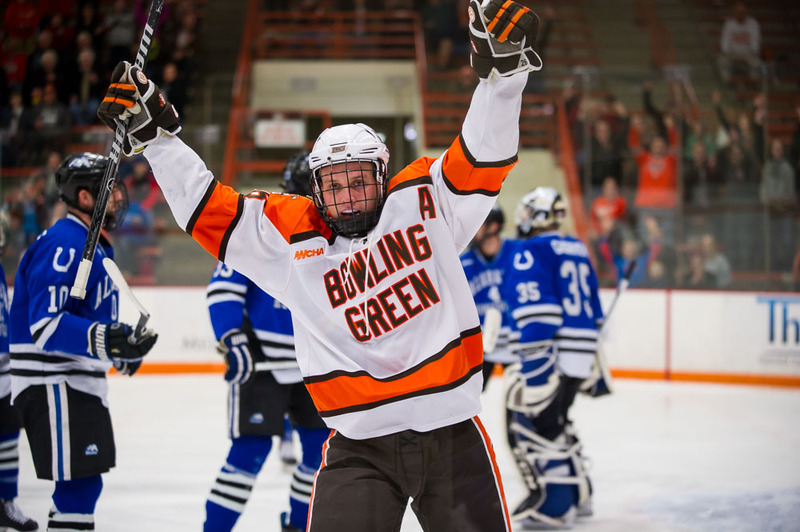 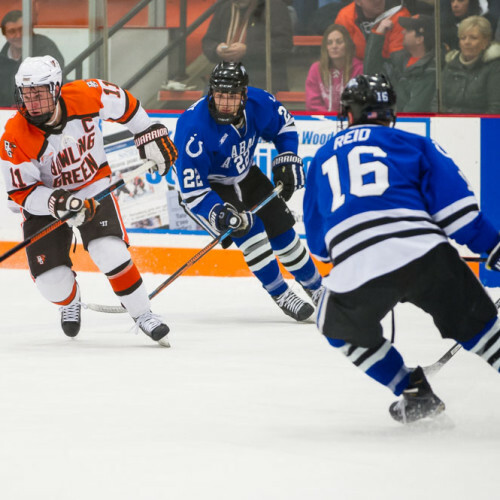 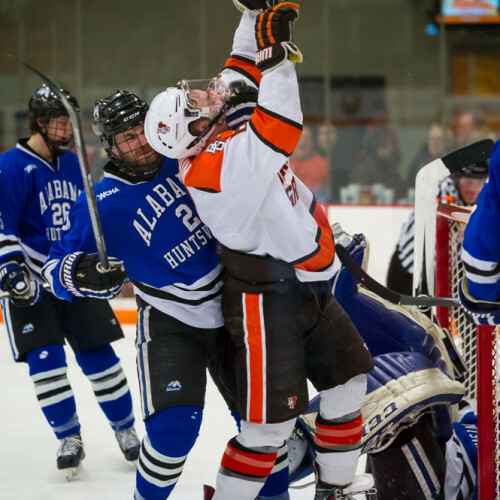 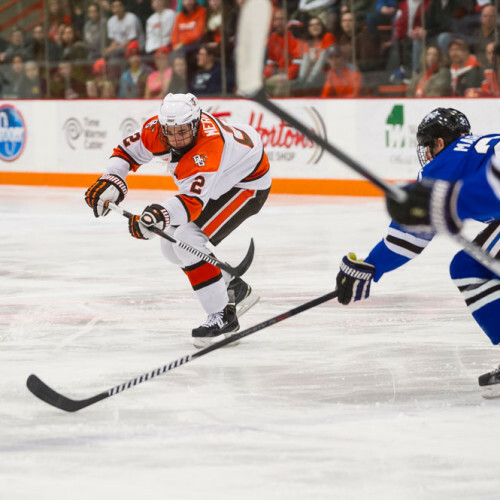 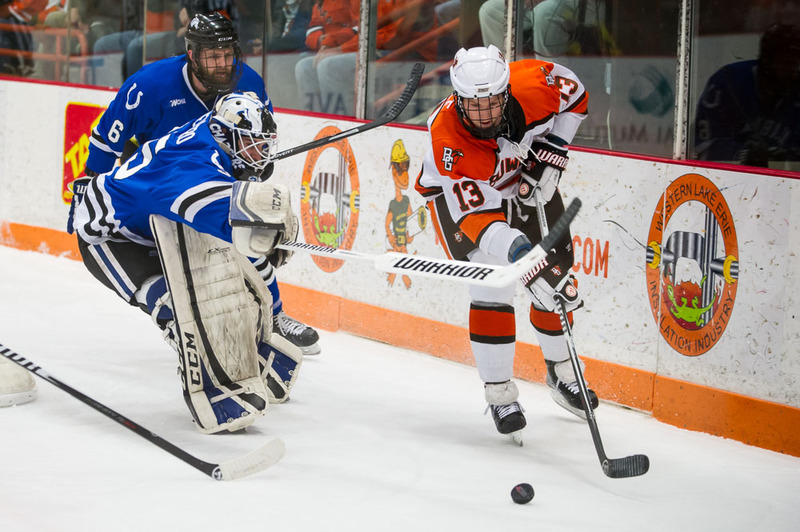 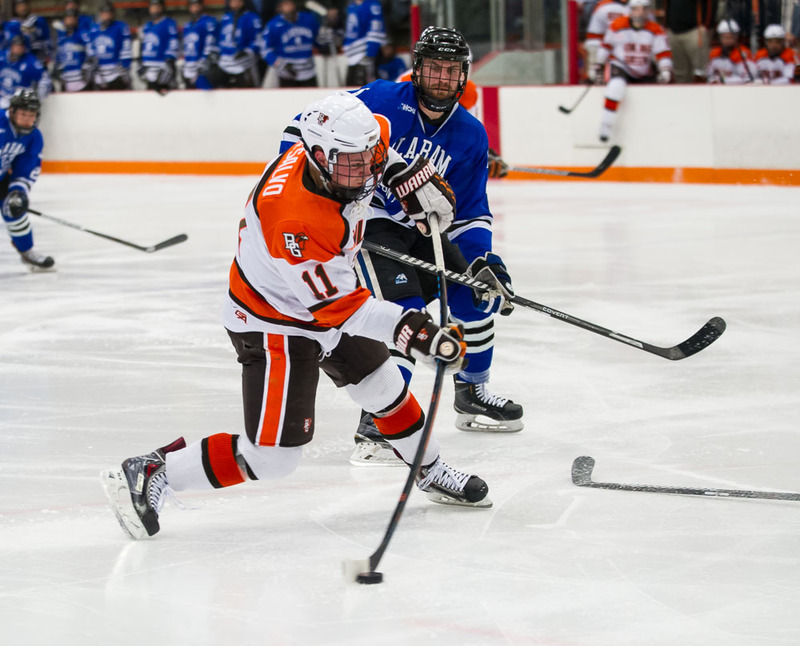 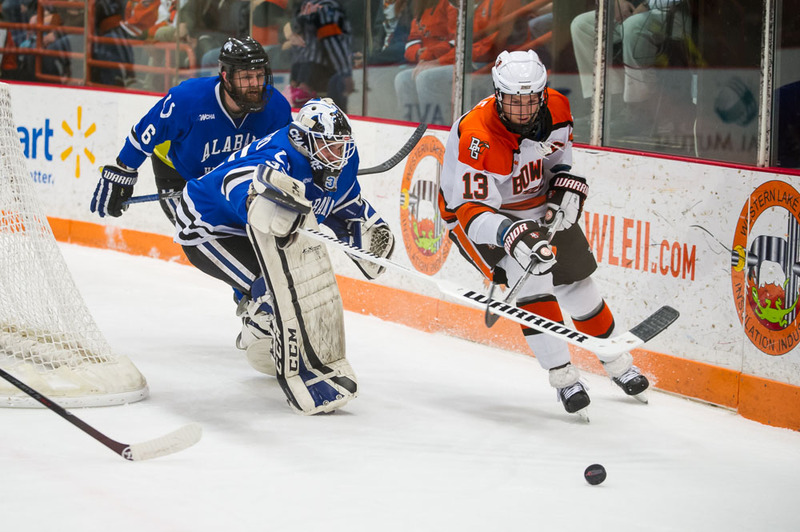 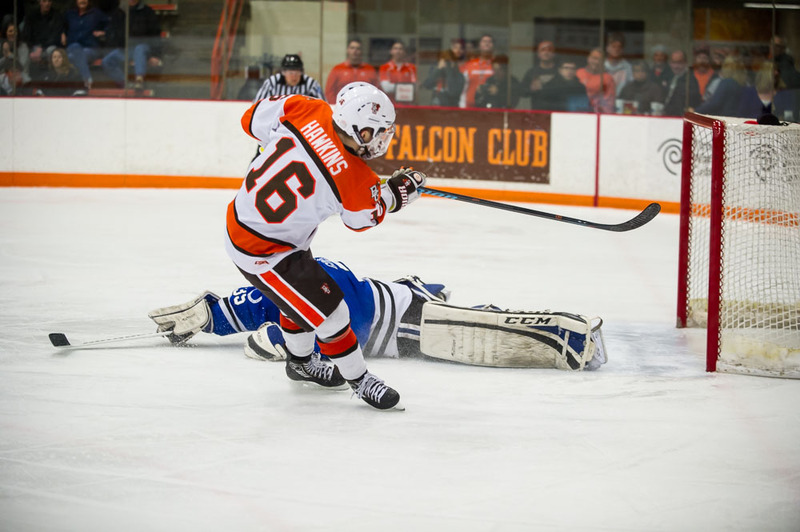 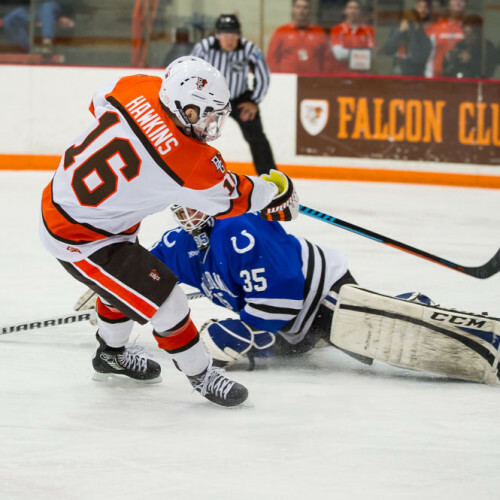 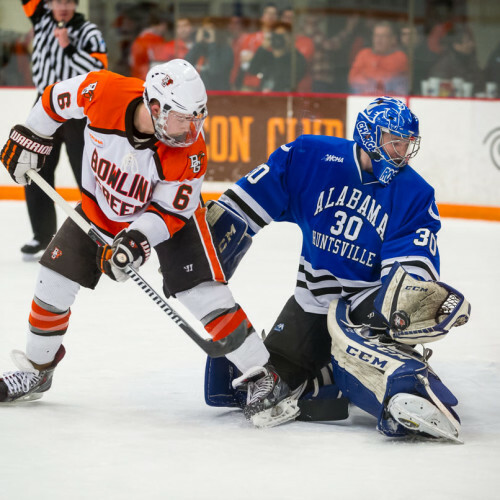 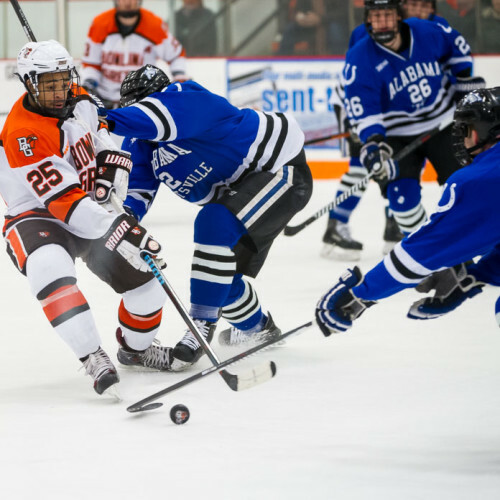 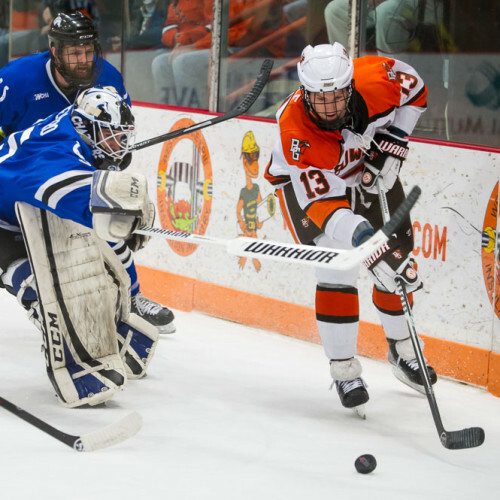 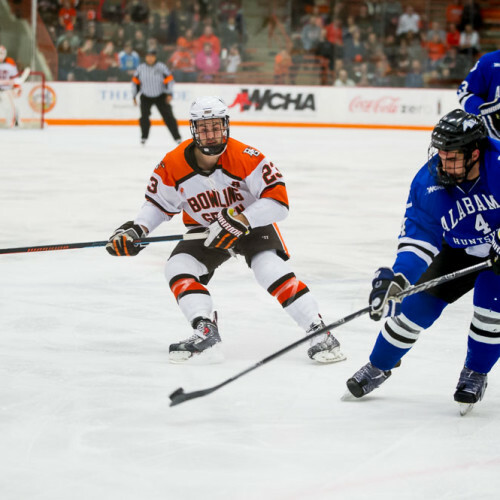 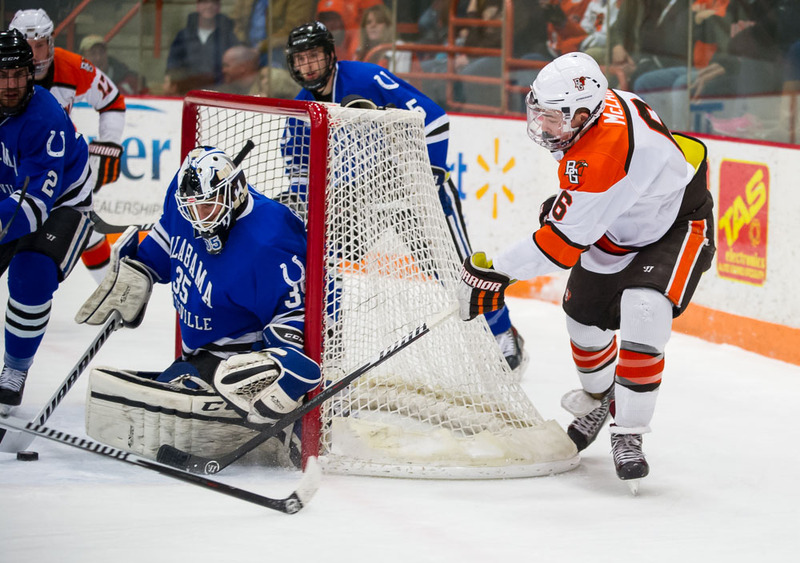 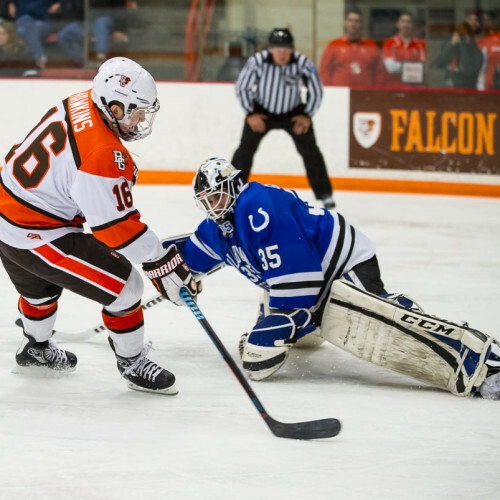 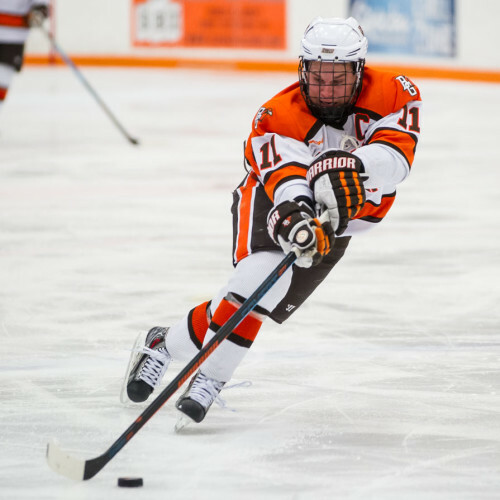 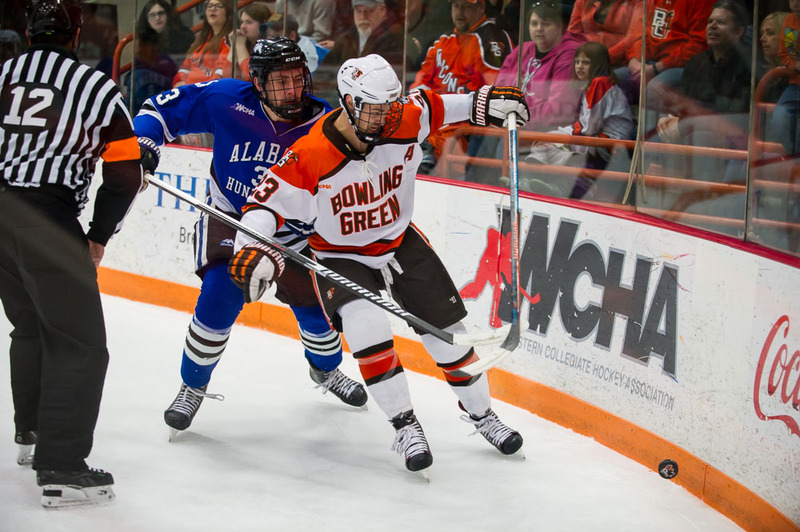 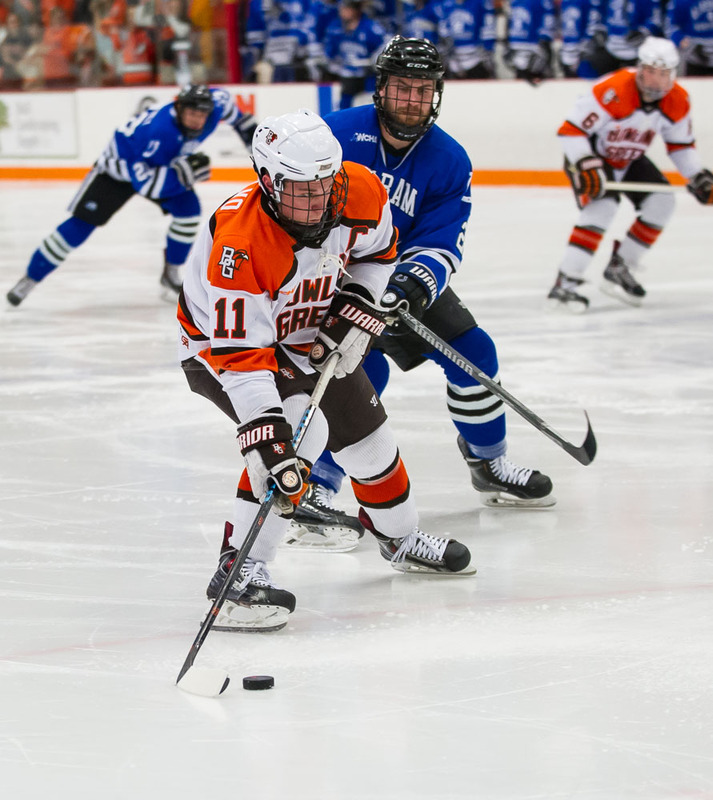 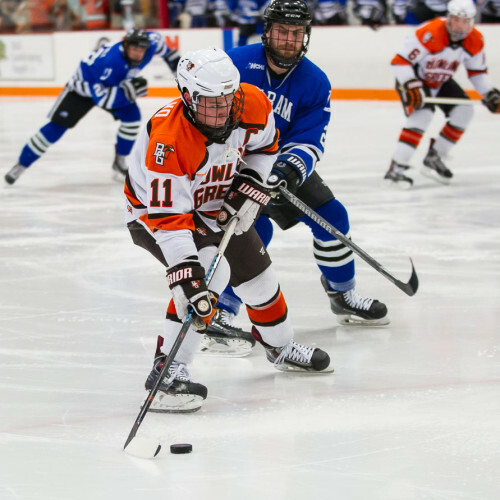 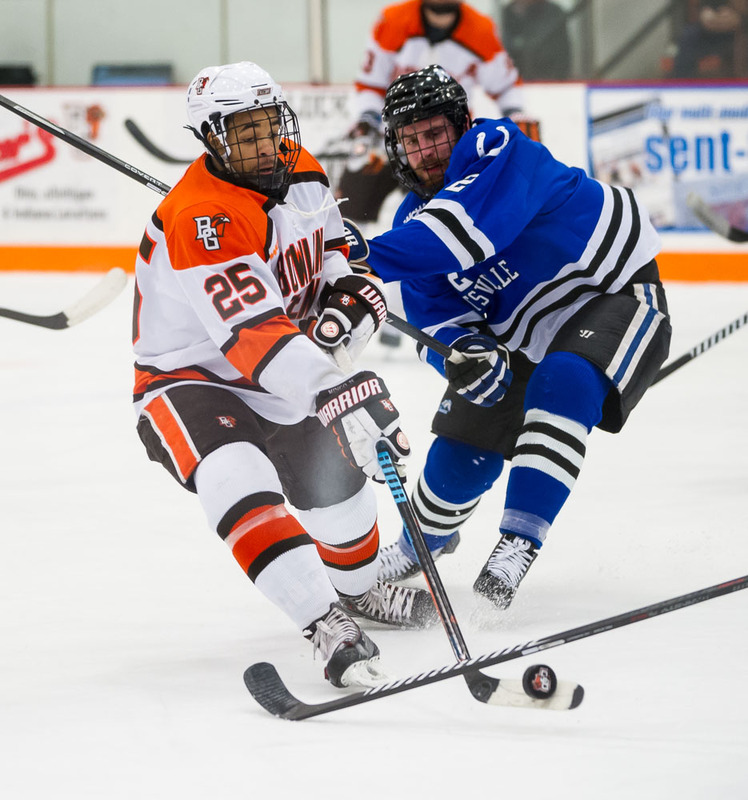 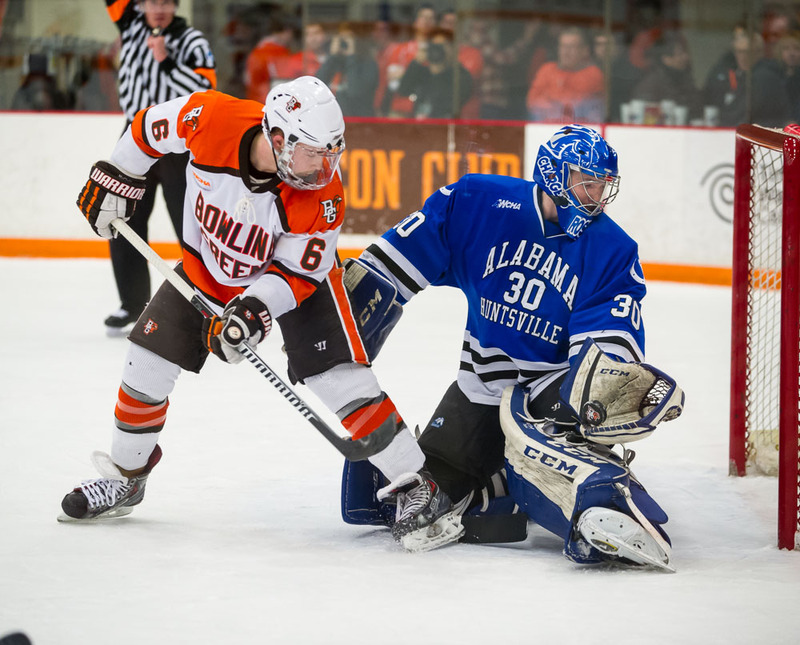 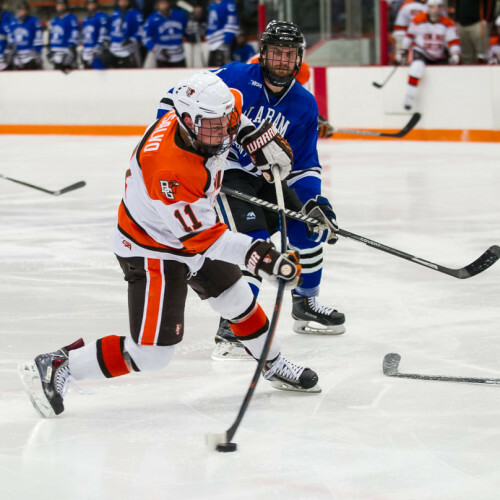 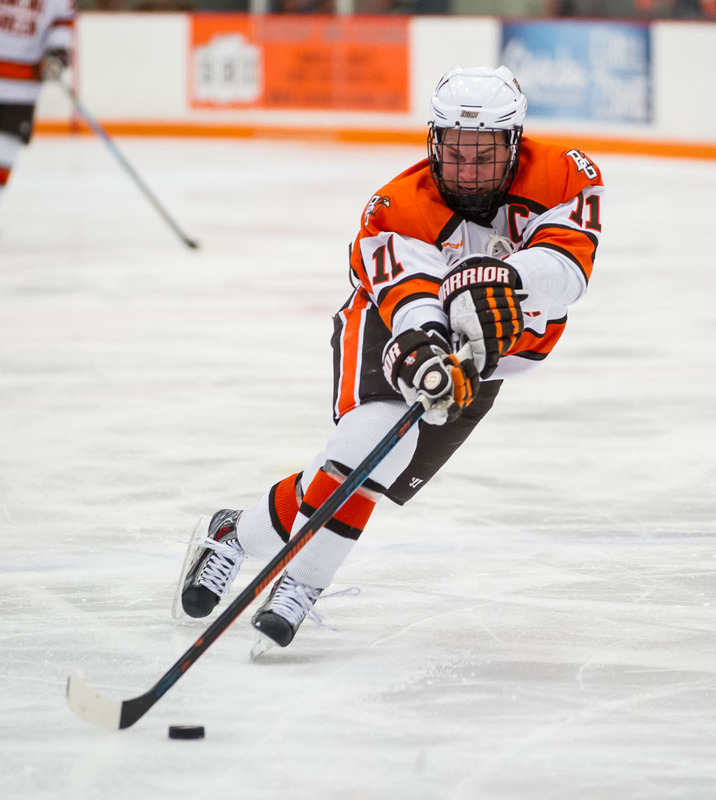 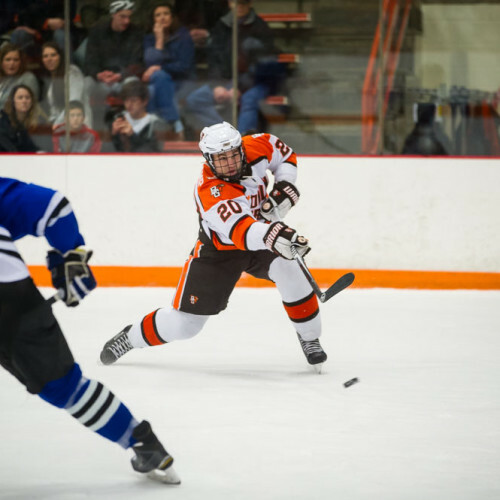 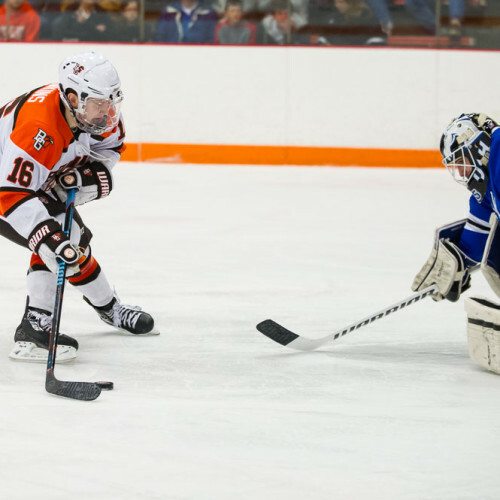 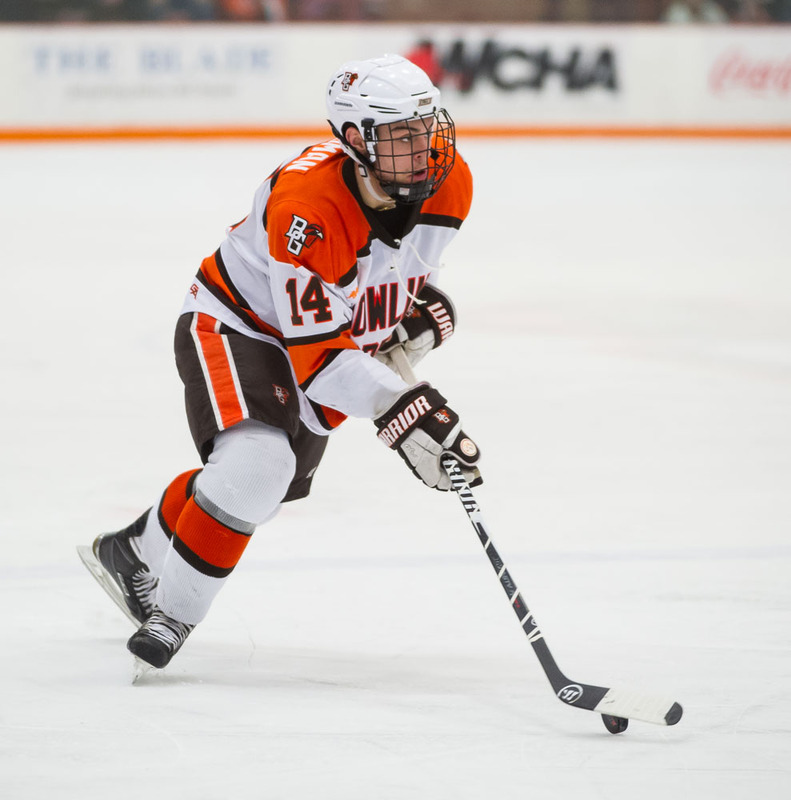 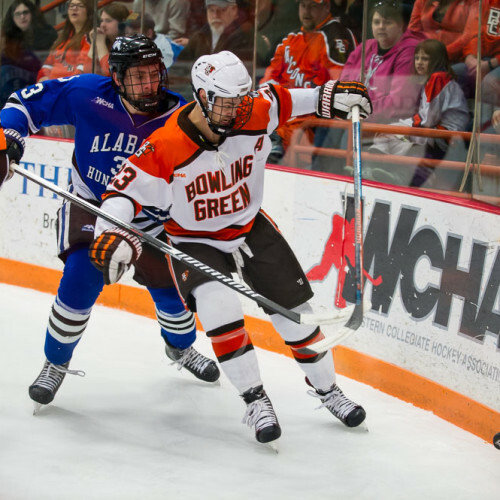 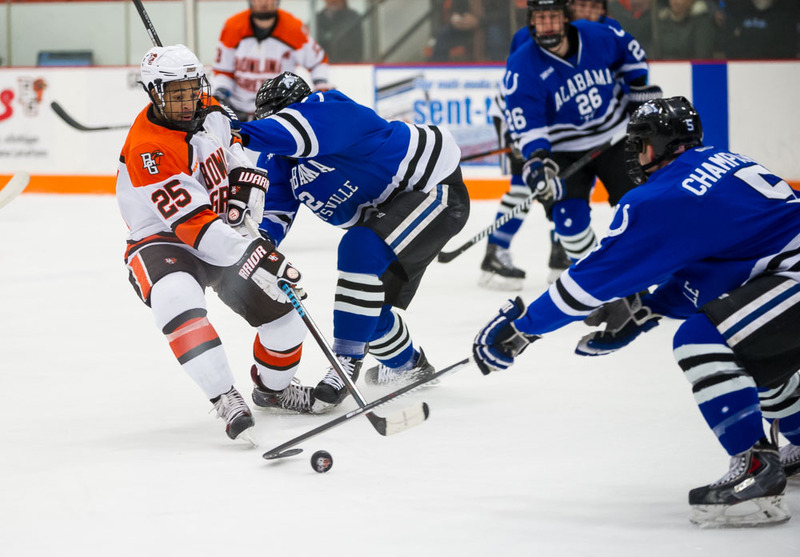 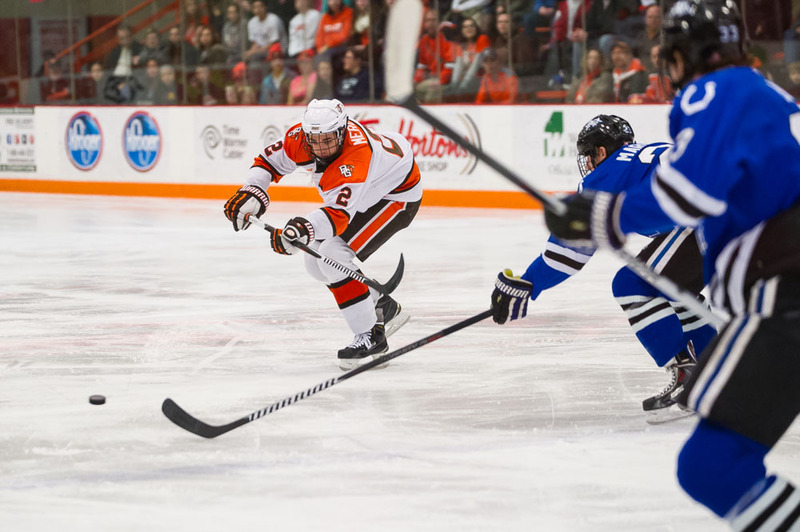 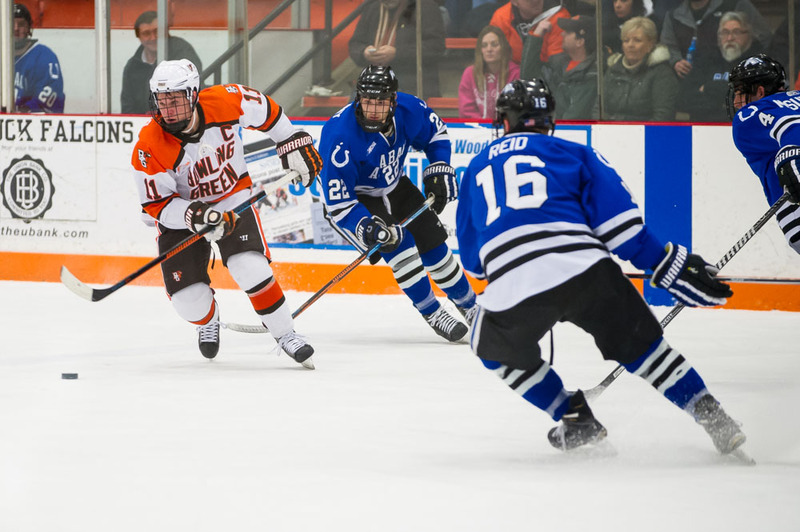 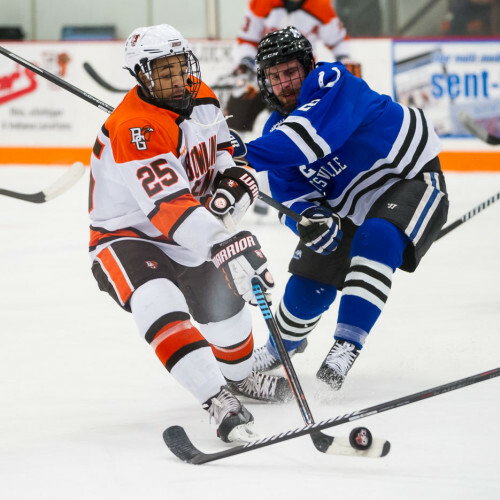 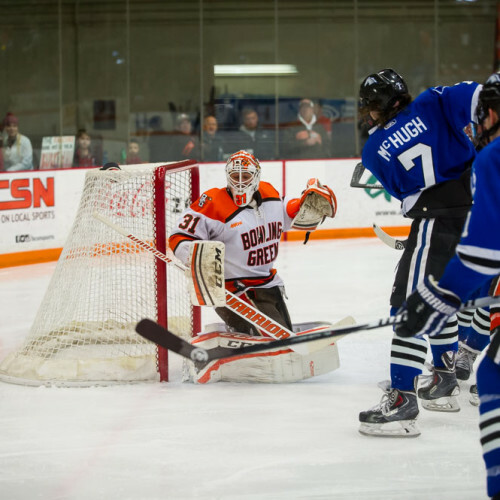 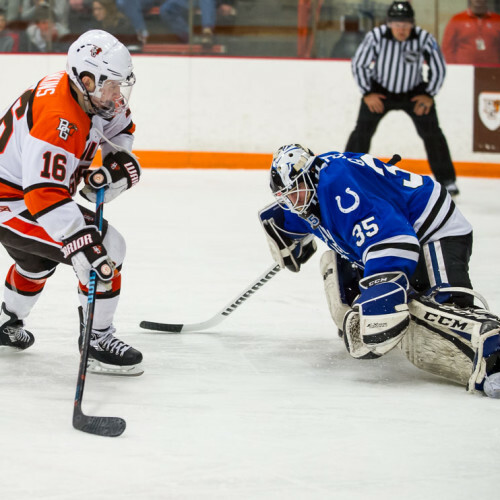 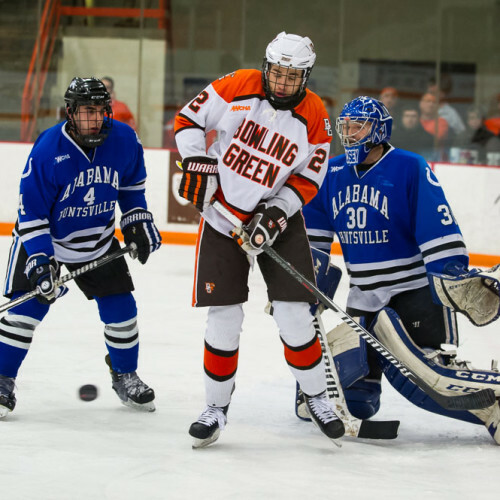 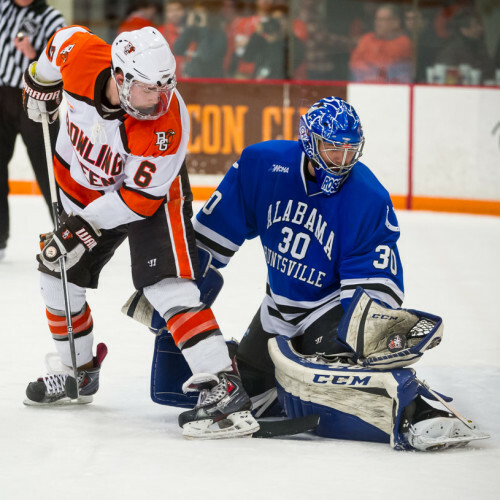 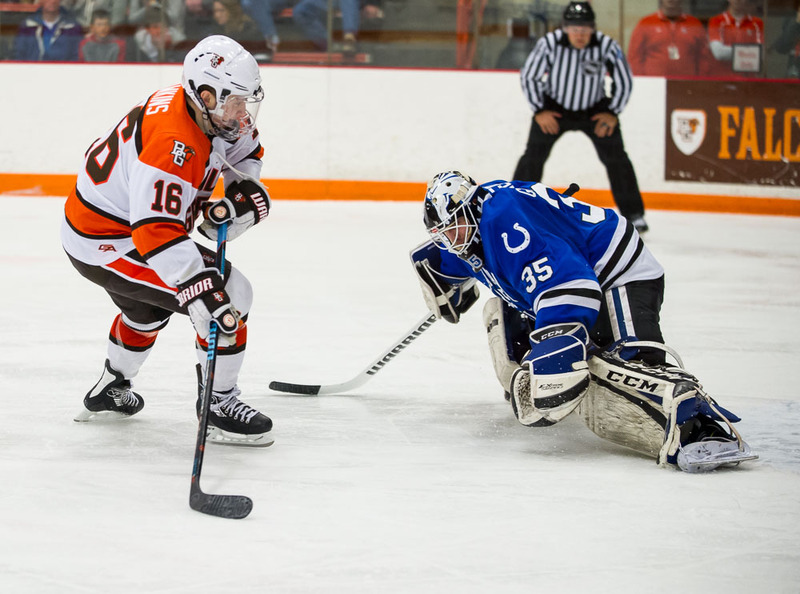 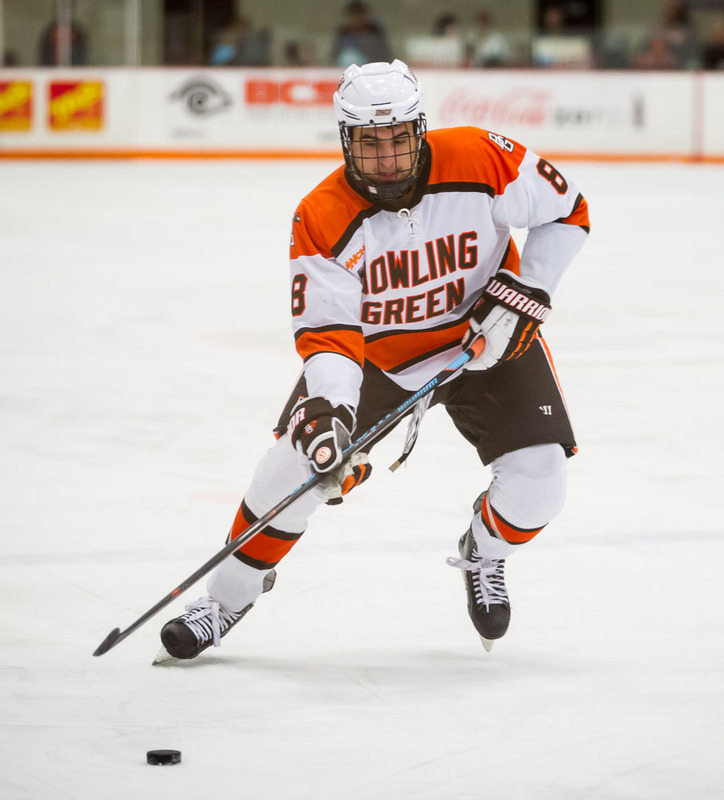 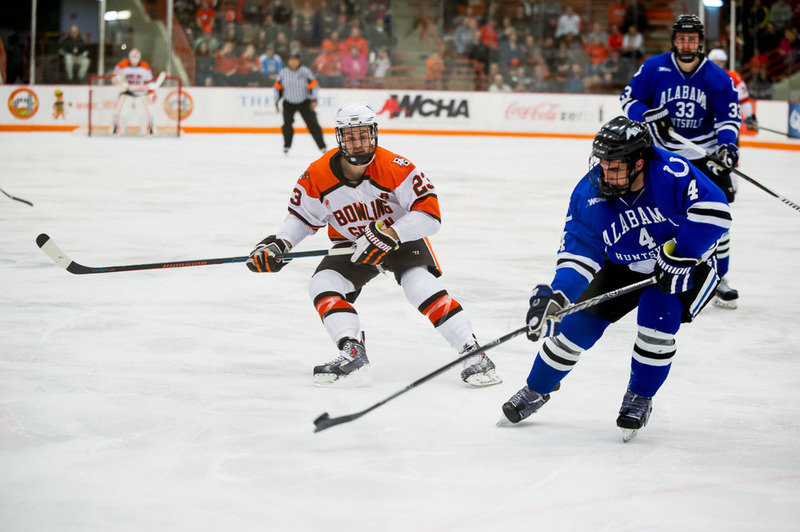 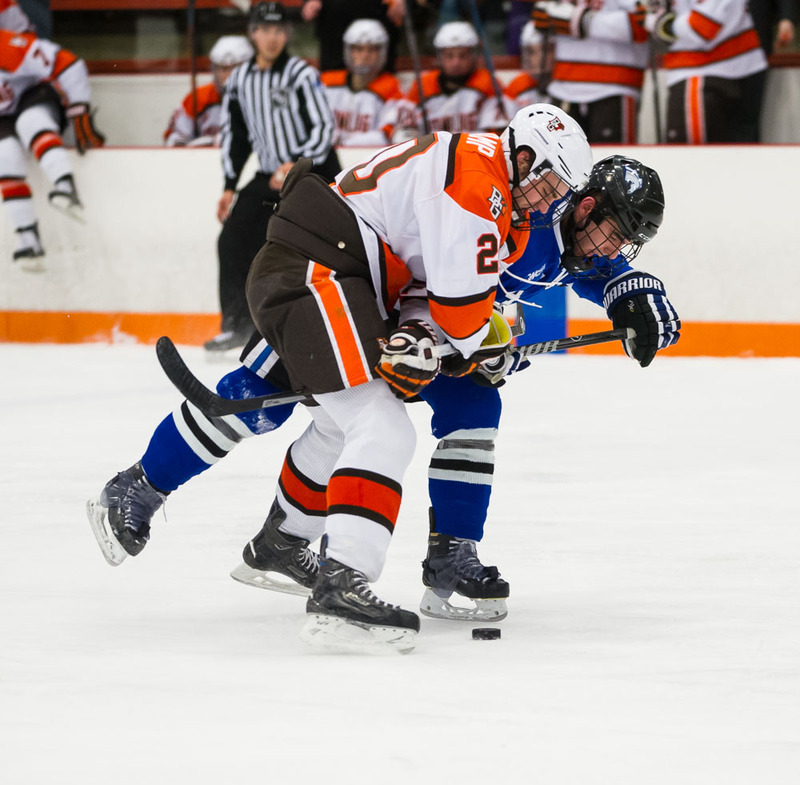 Brandon Hawkins had two goals and one assist, and Mark Cooper scored twice Friday to lead 13th-ranked Bowling Green to a 7-2 rout of Alabama-Huntsville in the Ice Arena. 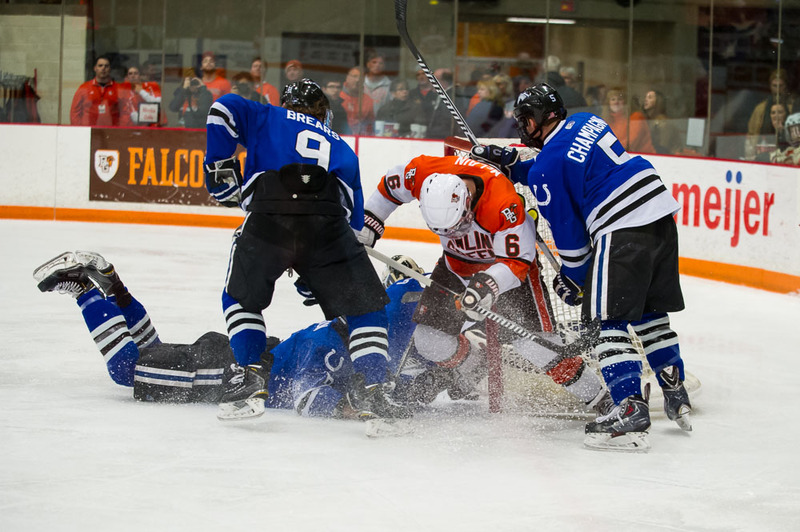 The Falcons scored twice in each of the first two periods, and ran the lead to 7-0 in the third period. 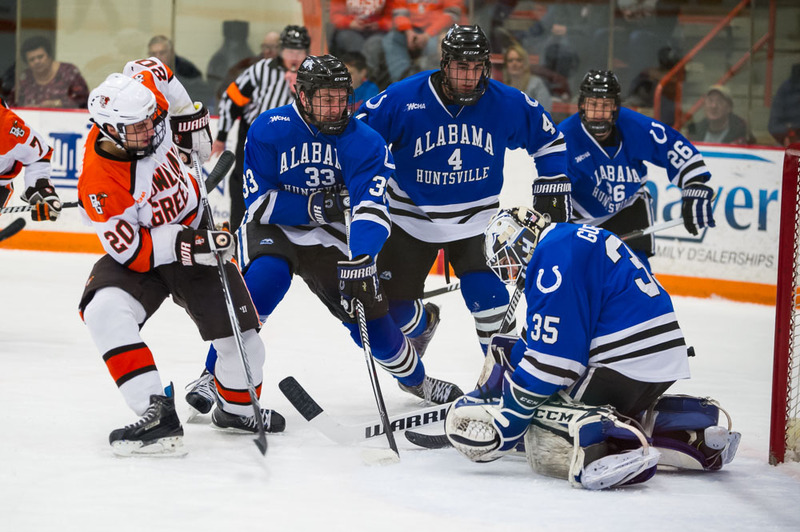 UAH spoiled BG’s shutout bid by scoring two power-play goals in the final six minutes, the first coming during a 5-on-3. 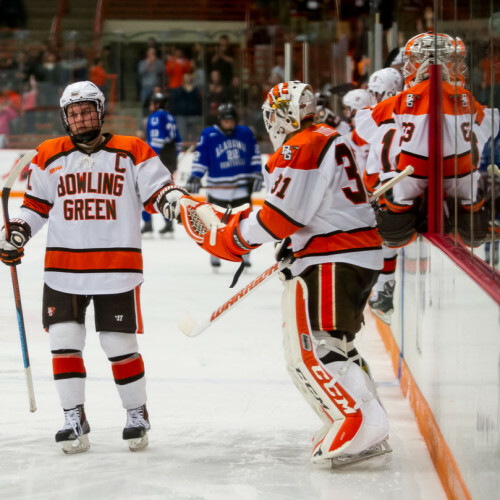 Twelve of BG’s 18 non-goalies had at least one point in the game. 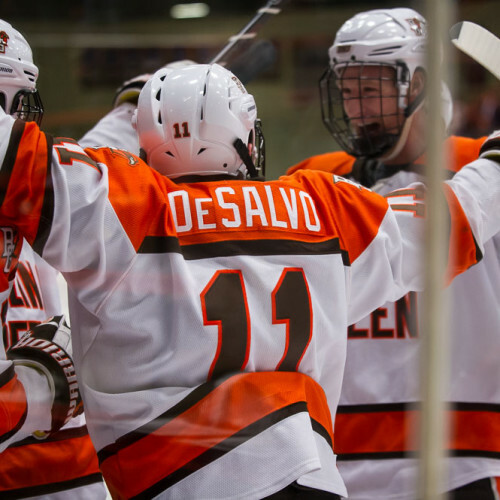 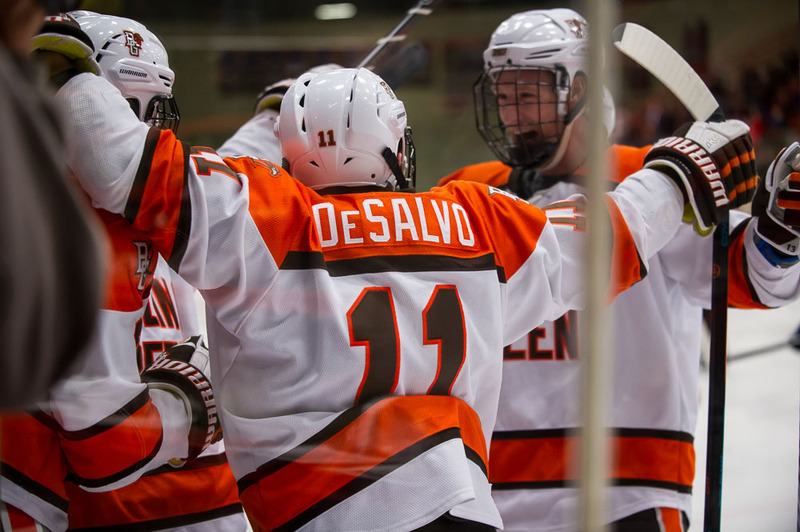 Dan DeSalvo had one goal and one assist for BG, and Pierre-Luc Mercier and Sean Walker scored the other goals. 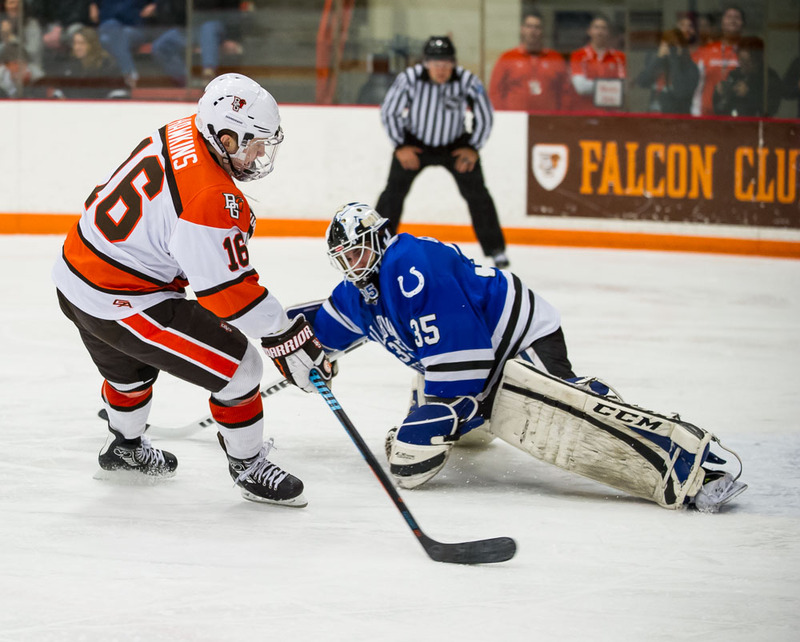 The Falcons held a 37-19 edge in shots, with Tommy Burke stopping 17 shots. 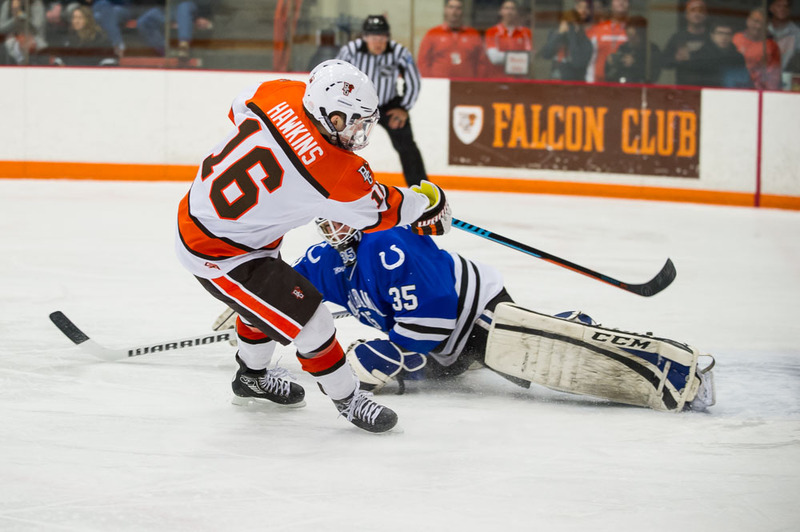 Two of Burke’s saves came on a breakaway in the first period with BG holding a 1-0 lead, and a third point-blank save came late in the period with Falcons leading 2-0. 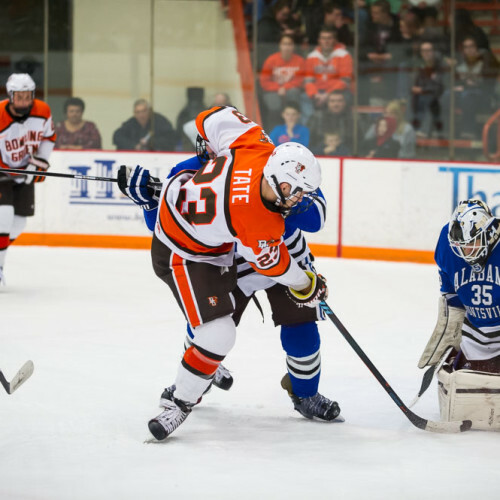 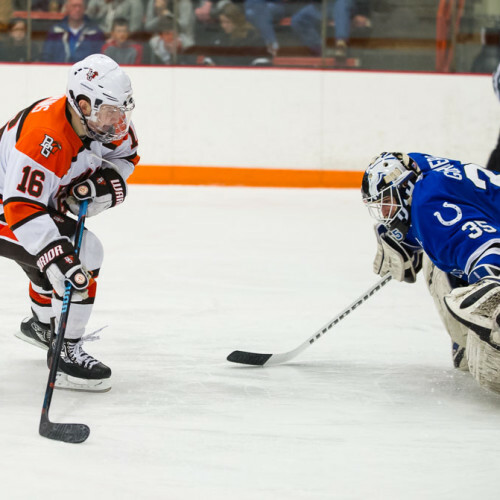 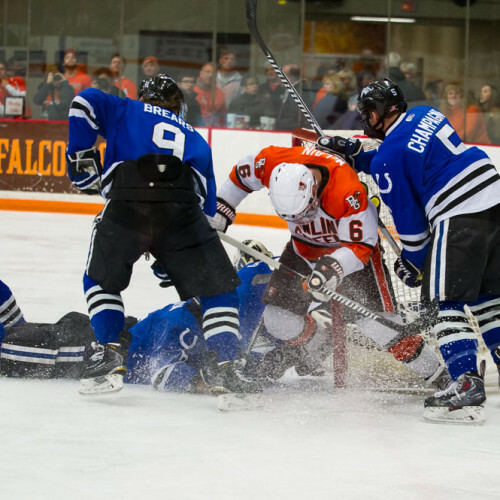 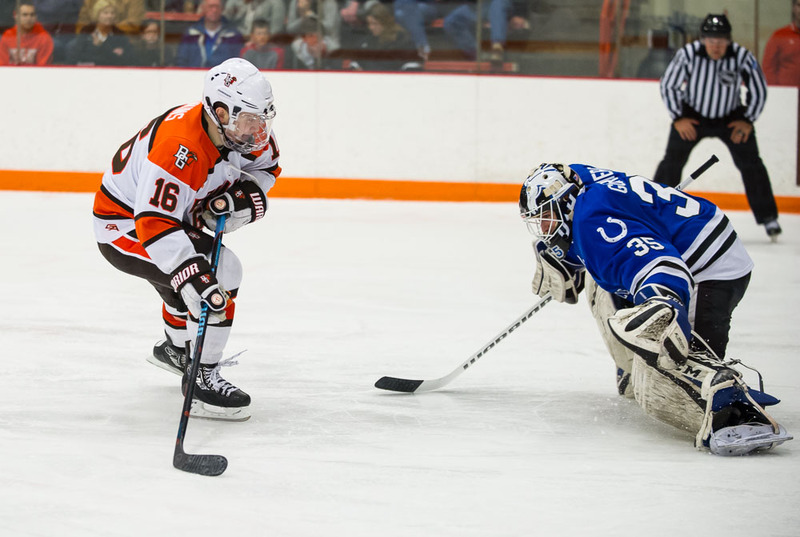 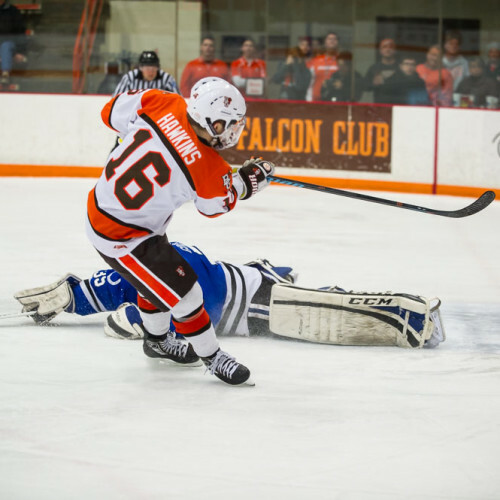 The Falcons, who were locked into third place in the Western Collegiate Hockey Association coming into the final series of the regular season, improved to 20-10-5 overall and 16-8-3 in the league. 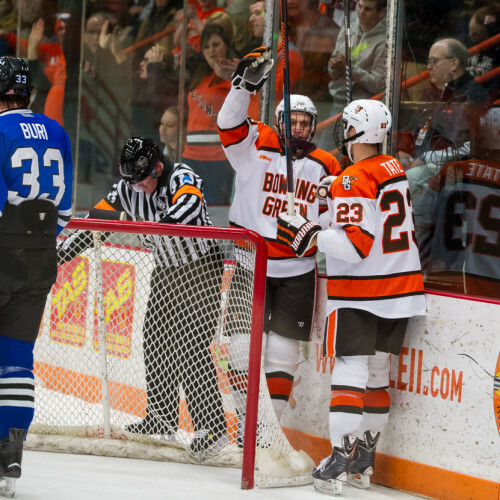 BG, which was 18-15-6 last season, reached the 20-win mark for the first time since the 1995-96 season when it won 24 times. 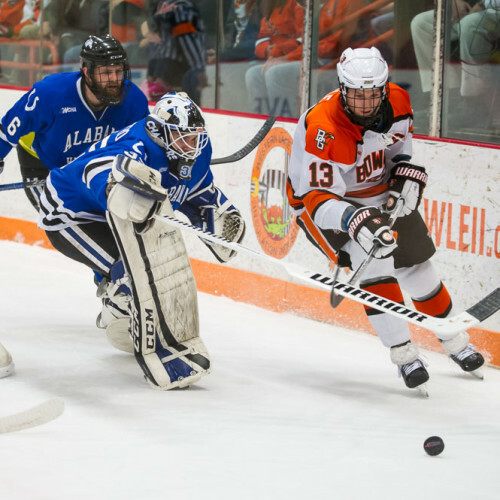 The Falcons had lost four of their last five games, including a 6-1 loss last Saturday at Alaska-Anchorage, the last-place team in the league. 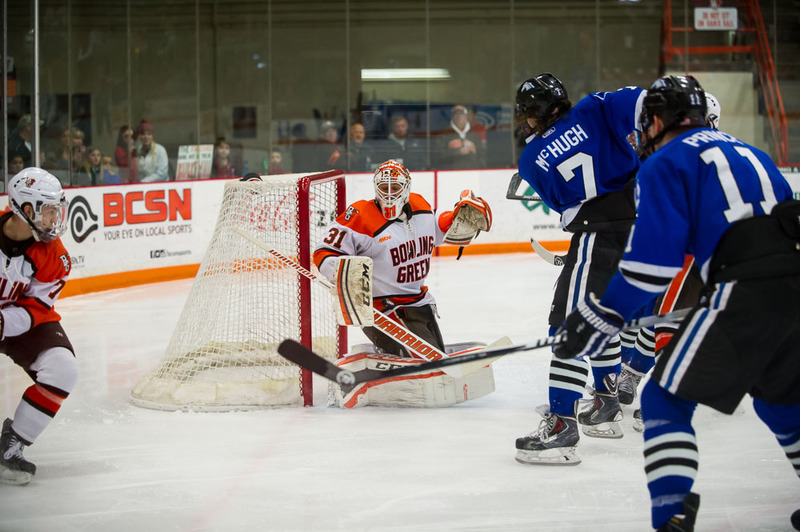 “It was important to play well and we played well,” BG coach Chris Bergeron said. 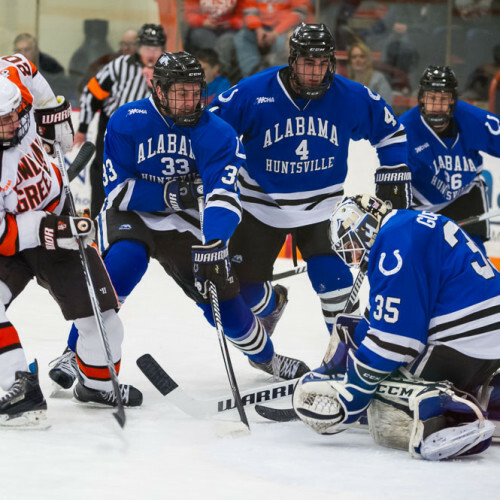 UAH, still fighting to earn a spot in the WCHA playoffs, is 8-23-4, 7-19-1. 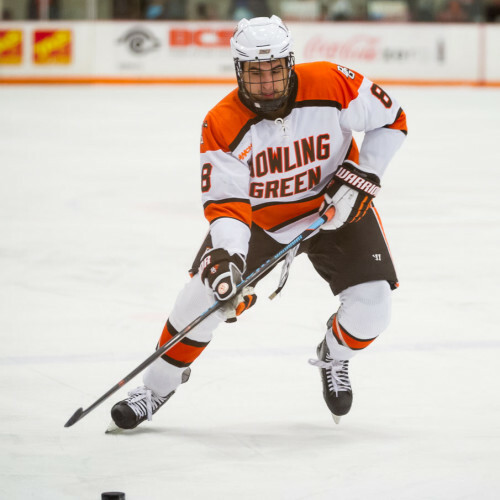 HAFNER: Bergeron announced after the game senior defenseman Rusty Hafner has been suspended for an undisclosed violation of team rules. 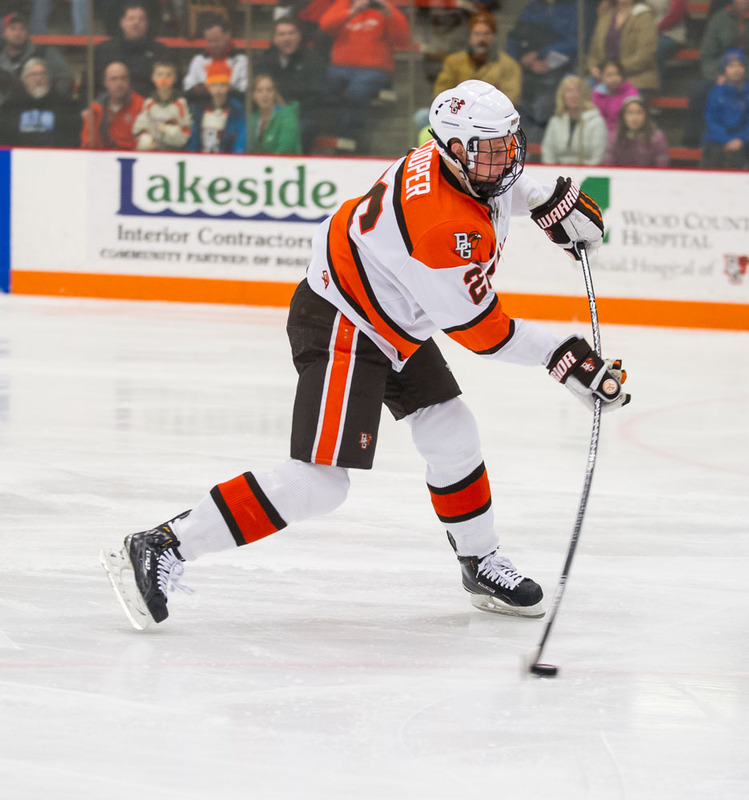 “You won’t see him for the rest of the year,” Bergeron said. 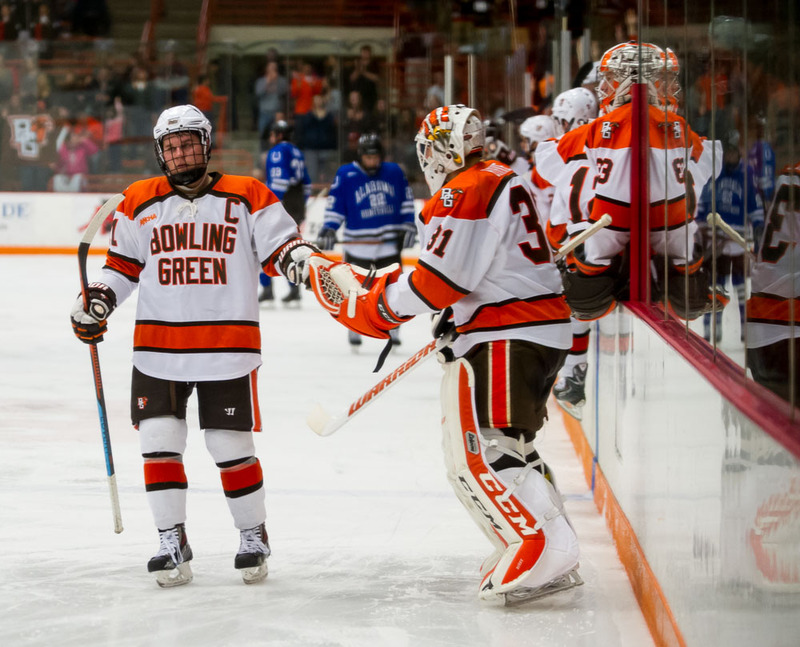 After Bergeron’s post-game press conference, BG Assistant Athletics Director for Athletic Communications Jason Knavel confirmed Hafner is no longer a member of the team. 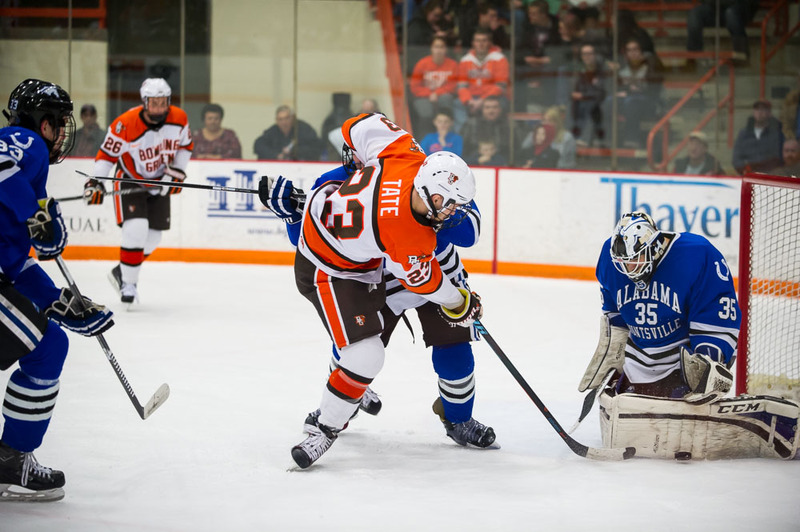 Hafner had played in just three games this season, totaling one assist and an on-ice rating of minus-3. 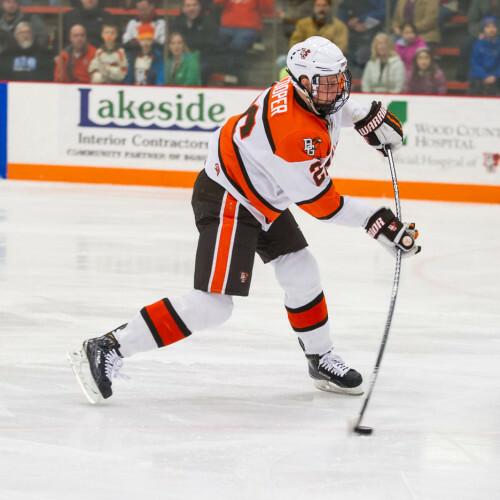 The suspension came earlier in the week, although Bergeron talked about Hafner and the team’s other five seniors during his weekly press conference on Tuesday. 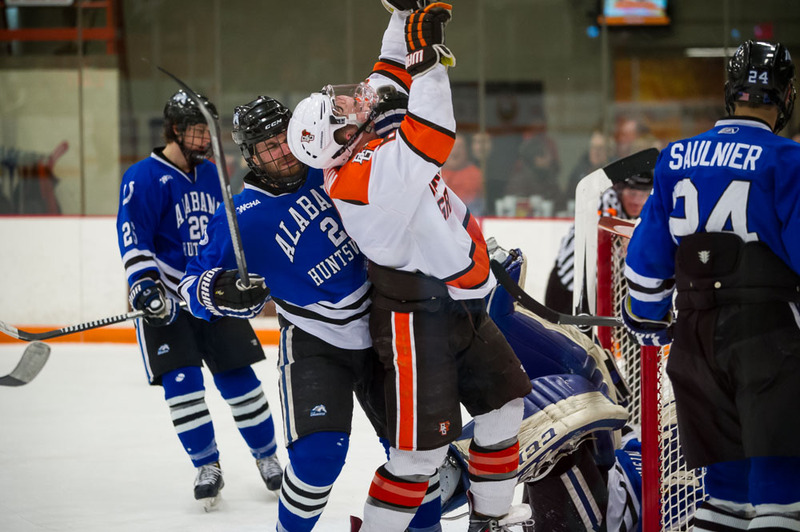 FINALE: The Falcons host UAH Saturday night at 7:07. 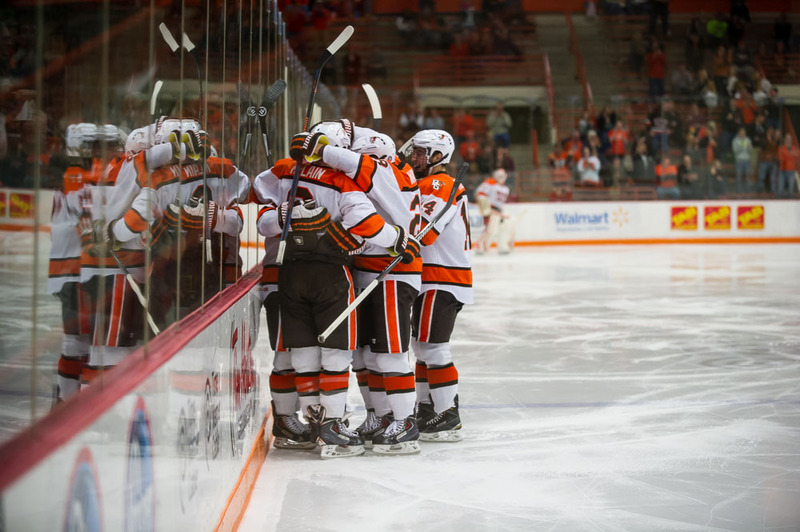 BG’s five remaining seniors will be honored before the game. 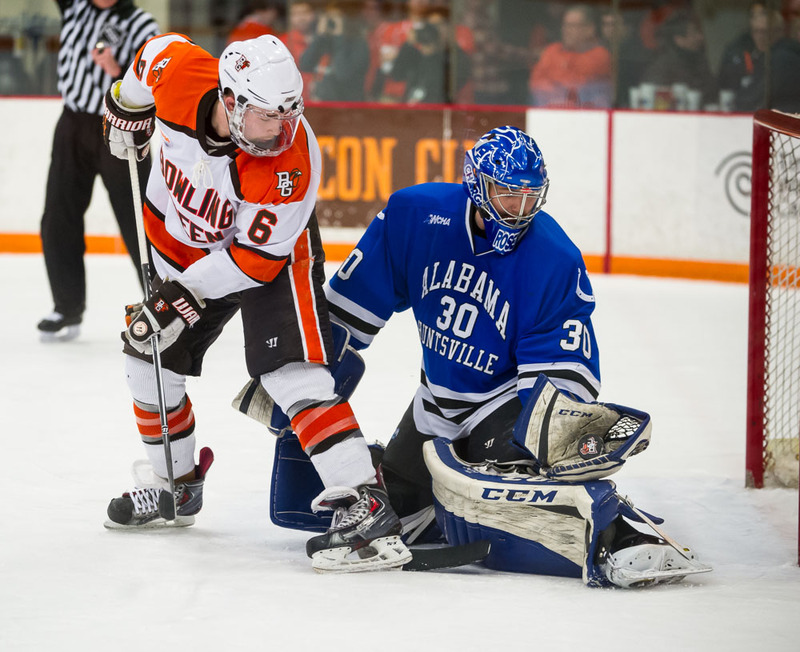 Todd Pavlack spoke to Captain Dan DeSalvo after the second period.